Truly I say to you, THIS generation [Greek: genea] will not pass away until all these things take place. Return for a moment to your pre-teen days. Every neighborhood had one of them, the kid whose sole goal was to win the game at all costs. This kid, if in the middle of a game and losing, would make up his own rules, redefine words in the rules, whatever it took to ensure that he'd win the game. As we all moved up into high school, many of our games acquired referees, we matured enough to follow the rules, and these childish antics were halted. Because of this intellectually dishonest abuse of language, some Christians need to have a "referee" curb their creativity in making up rules and definitions, which they make up solely to win arguments. Dictionaries already exist, scholars already have done the dog work, rules are already in place. These are our referees. And as you will see from what follows below, the vast majority of Christian scholarship shows that there is little doubt as to what the word "generation" (Greek: "genea") really means in this Bible verse, and what this Bible verse as a whole, is really saying. The consensus of the scholars, i.e. our referees, will be stated below without comment, because no comments are necessary. Readers who want to know the sources of the quotations can match the numbers before the quotations with the numbers in the listings of translations, commentaries, lexicons, etc. at the end of the article. (53) I tell you the truth, this generation will not pass away until all these things take place. (54) Truly I say to you that this generation will by no means pass away until all these things take place. (55) I assure you that all these things will happen while some of the people of this time are still living. (56) Truly, I say to you, this generation will not pass away until all these things take place. (57) Verily I say to you, this generation shall not pass, till all these things be done. (58) I can guarantee this truth: This generation will not disappear until all these things take place. (59) I tell you the truth. All these things will happen while the people of this time are still living! (60) Verily I say unto you, This generation shall not pass until all these things are fulfilled. (61) Truly I say to you that this generation will never pass away until all these things take place! (62) I can guarantee this truth: This generation will not disappear until all these things take place. (63) Amen, and I say to you, this generation will not pass away until all these things have taken place. (64) I tell you the truth, this generation will not pass away until all these things take place. (65) What I’m about to tell you is true. The people living NOW will certainly not pass away until all these things happen. 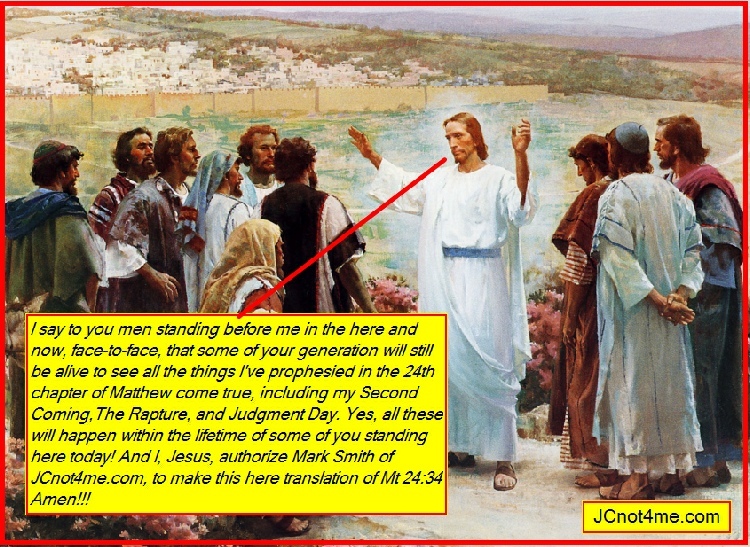 (66) For sure, I tell you, the people of this day will not pass away before all these things have happened. (67) I tell you the truth, this generation will not pass from the scene until all these things take place. (68) Omein, I say to you, that this dor (generation) will by no means pass away until all these things come about. (69) Amen, I tell you, this generation will not pass away until all these things happen. (70) I tell you this: this generation will see all these things take place before it passes away. (71) Most certainly I tell you, this generation will not pass away, until all these things are accomplished. (72) Truly I say to you, for this generation shall not pass, till all things be done. (73) Verily I say to you, this generation may not pass away till all these things come to pass. (74) So you, when you see all this, will know that it is at hand, at the very doors. I tell you truly, this generation will by no means pass away before all these things take place. (14) NEW AMERICAN BIBLE REVISED EDITION: The difficulty raised by this verse cannot be satisfactorily removed by the supposition that this generation means the Jewish people throughout the course of their history, much less the entire human race. Perhaps for Matthew it means the generation to which he and his community belonged.